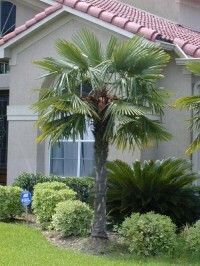 Windmill palm is one of the most cold hardy palms available. Windmill palm has a rather slender single stem that is 8-10 in (20-25 cm) in diameter and is typically a bit narrower at the base than at the top. Trunks are usually covered with a loose mat of coarse gray or brown fiber. In older individuals the fiber sloughs away to reveal a smooth ringed surface. 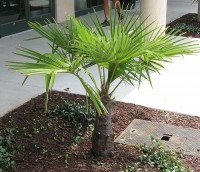 Chusan palm, as it is also commonly called, has light to dark green palmate leaves that are lighter, almost silvery, on the underside. Leaves are circular, about 3 ft (0.9 m) in diameter and segmented about halfway. Specimens grown in full sun and/or under poor conditions may have much smaller, more compact crowns.